While Sally may be new at Disneyland Park's Haunted Mansion Holiday, over in Tokyo's Haunted Mansion Holiday Nightmare, Sally has been a fixture for years. She can be found early on in the ride, in a scene that does not occur at the original home of Grim Grinning Ghosts. 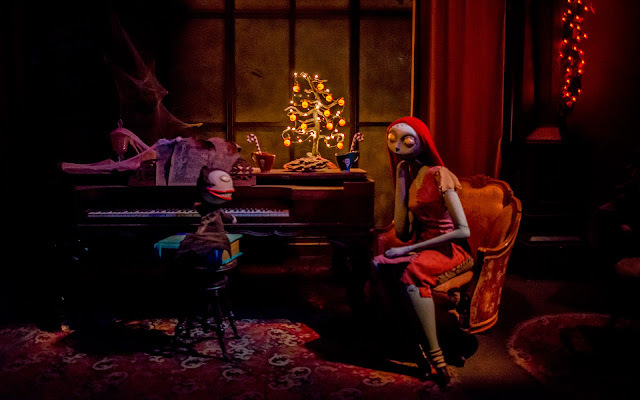 Sitting next to Vampire Teddy as he plays a little jingle at the harpsichord, Sally takes in the enchanted and eerie ambiance. Teddy does his best to impress her, but I'm sure her mind is still on her beloved Jack Skellington. After all, a musically inclined blood-sucking plush might be impressive, but there's only one Pumpkin King.